Q: There are many things to take on-board for a rookie in Formula 1 because there is so much different technology to anything you’ve been used to before. How are you facing the start of the season at the moment? AA: Obviously, I think it’s going to be a steep learning curve. I’ll get four days of testing in Barcelona before Melbourne so we don’t have a lot of driving. The main focus is to be comfortable in the car and get up to speed as quickly as possible. We’ll see. In terms of my personal preparation, I’ll try not to put too much pressure on myself and give it everything I have from day one. It’s my opportunity this year to show everyone what I’ve got. Q: You’ve spent a lot of time in the simulator, presumably to get up to speed with the circuits? AA: Exactly, yes. That’s the priority right now. Apart from trying to maximise the time in the simulator, I am spending a lot of time just being with the team. Everything is aimed at understanding the car as quickly as possible which will help me for Melbourne. Q: What’s going to be the biggest change from F2 to F1? Getting used to the hybrid Power Unit? AA: Yes, I’d say so. I was fortunate to do some Formula E testing, so when I did that I learned a lot about the powertrain and it’s quite surprising how similar the two are. I wouldn’t say the technology is the same, but the way you have to save energy and things like that, they’re very similar. It was useful to have done that testing, I think it won’t be too difficult to adapt to that. The main thing really is just the pure speed of the car. Obviously, these cars are quicker than ever now, even if speeds might drop a little this year. But in terms of the jump from Formula 2 to Formula 1, it’s really, really big. That’s mainly from the downforce. I think the speed won’t be too difficult to deal with, it’s more just the pure width of the car I’ll have to get used to. Secondly, something which I think people don’t realise, is just the sheer amount of people and the work ethic involved in F1. It’s different in the sense that you have so many people working for you and they’re all striving to be as quick as possible, so for a driver there’s a lot of interaction with the team. There’s always someone that I need to speak with in order to get the maximum out of the car. In Formula 2, I had two engineers, there was a head engineer and I had two mechanics in total. So that’s six or seven people and now I’m going to a team that’s got almost 400 people. It’s a different ball game but I’m getting used to it – It’s a nice problem to have! Q: So you’ve gone for a half-Rossi? AA: I’ve gone for a half Rossi. 23 has always been a good number for me. I’ve had it a few times. I’m happy with it. There wasn’t really too much thinking behind it, but I thought I’d carry on my tradition of wearing the Rossi number somehow. AA: It’s a big deal for me to be a Thai driver. 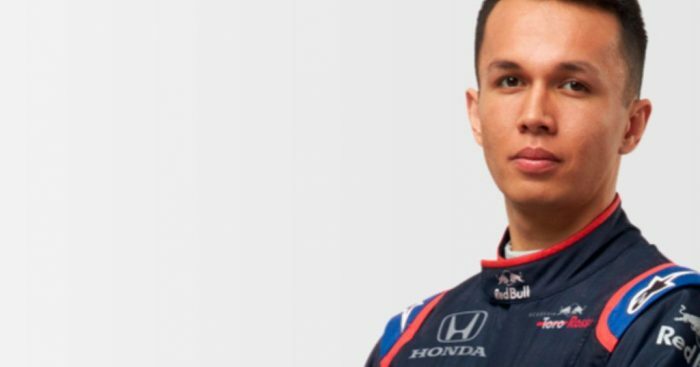 It’s been a long time since there’s been a Thai in Formula 1 and I’m just hoping to do everyone proud. AA: I haven’t paid much attention to it. It’s quite a special year in that sense because you have a lot of F2 drivers coming into F1. I think it’s been a very long time since three drivers came from F2 to F1. We know that in Formula 1, the drivers are the best of the best, so it’s nice to know that pretty much half the grid is made up of drivers I’ve karted with or raced against, with George and Lando. being part of that number as well obviously. It’s just nice to be racing at the top level with the guys I’ve driven against throughout my career to date. AA: Yes, there’s a bit of a story. In Thailand, the royal family are extremely highly respected and King Rama IX was one of the most respected people in Thailand. King Rama IX did a lot of charity work, a lot for the working class and he passed away in 2016. So I’ve got the number 9, written in Thai on my helmet, as that was part of his symbol. Another reference to Thailand on the helmet is the Thai flag included in my name. Q: Let’s stick with Thailand for a bit. We don’t race there. Is there a thriving motorsport scene there? AA: I’d say so and in fact, a couple of years ago, there was talk of holding a Formula 1 race there. They have a circuit ready that’s F1-capable. I think it would be great to have a race there, it would be just amazing. Obviously, Vietnam is coming next year and that’s one step closer. That’s given me at least something similar to a home race, I’d like to think. Motorsport is getting bigger in Thailand and I’d hope they have someone to root for this year in F1. AA: Milton Keynes, which is handy for the simulator. I’ve been living there for a while now. AA: I think it’s always good. In motorsport, especially in go-karting, the pinnacle of motorsport is in Italy so you spend all your time in Italy. I’m a bit jealous of people like Daniil who can speak Italian…I really can’t! I spent two years there but I didn’t really speak to the team in Italian. I can understand a bit of it but not enough. I’ll learn throughout the year and I’ll try and get better at it. Q: Are there any races that you’re looking forward to particularly, either because you like the track or for some other reason? AA: I would say Japan because Suzuka seems like a great track. When you look at it from the outside, you see the fans and you see the passion. I really like the country as well. I’ve been there once before. The track is a serious one because it’s an old-school, no-mercy circuit. It looks really, really cool to drive. I’d say definitely Japan. AA: In general, the way I’ve gone about my career and my racing, is I never set any goals on anything. Every year, it was just each race, take it step by step, focus and race in that session – whatever it would be, practice, qualifying, the race. Just take it as it is. If you start setting long-term goals, you just put unnecessary pressure on yourself. I’m just focused on myself and let’s see how it all goes.